LUBBOCK, TX -- A Texas man is such a staunch supporter of President Donald Trump he went as far as to get his name tattooed on his neck. 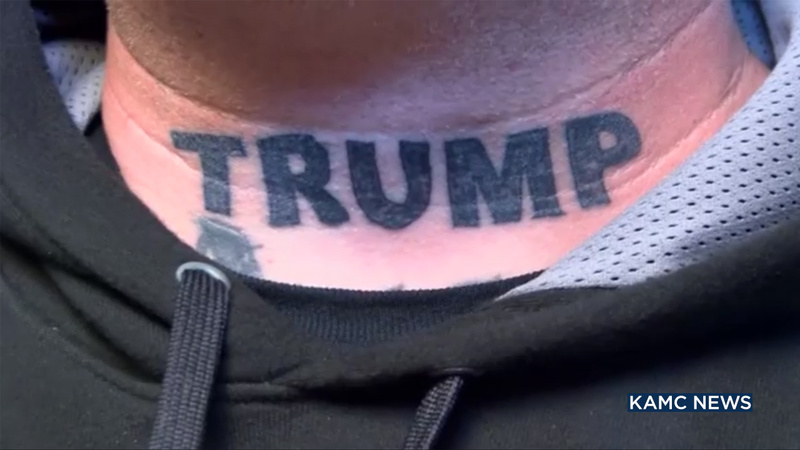 ABC affiliate KAMC in Lubbock, Texas, reports Brian "Goober" Williamson got "Trump" tattooed on his neck a couple of weeks before the president's inauguration. "I don't want to hide it," Williamson told KAMC. "I'm not scared to show what I've got. You either love me or you don't." Williamson said showing support for the 45th president of the United States doesn't go over well with everyone. "If I put a sign in my front yard, they'll vandalize my house. If I put a sticker on my truck, they're going to screw up my truck. Well, come vandalize me, that's all I've got," Williamson explained. Along with his bold tattoo, Williamson also made a bold prediction. "This, mark my words, is going to be the best president we've ever had," he said.